Sad, sad news people. 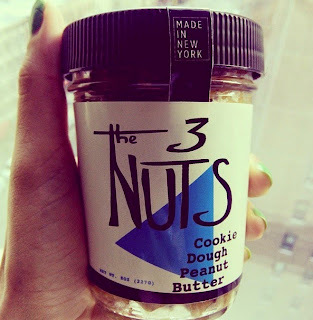 The absolutely incredible 3 nuts Cookie Dough Peanut Butter I bought in New York at Smorgasberg market ran out last week. I was enjoying it in so many ways : spread on toast, mixed into my porridge, as a key feature in some very delicious chia seed puddings, and in all honesty, more often than not just straight from the jar and into my mouth. 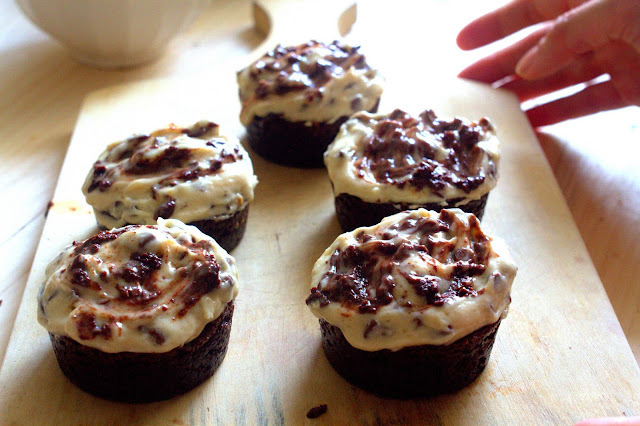 Say hello to Peanut Butter Brownie Cupcakes with Cream cheese Cookie Dough icing. 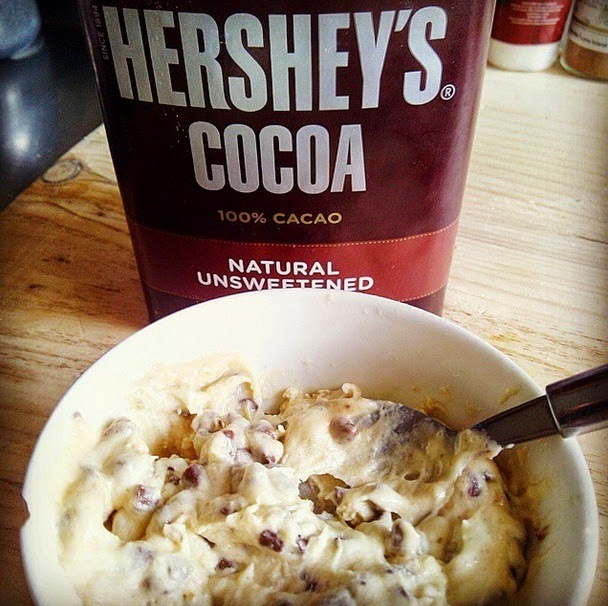 Sweet cream cheese cookie dough icing meets rich cocoa brownies. The rest is history. The touch of cream cheese with the cookie dough makes for a very smooth, spreadable icing. And it couldn’t be simpler to make! To make the icing I literally whacked everything in my blender and mixed in the chocolate chips at the end. The icing is sweet (of course), but ended up as the perfect topping for the rich chocolate brownie recipe I chose to follow. Taken from the incredible food blog smitten kitchen, this brownie mix uses just cocoa powder rather than melted chocolate. I tweaked smitten kitchen’s recipe slightly with the addition of swirls of peanut butter (chunky, please) and I opted for a mix of white and brown sugar, as I felt this would provide a good sweet balance against the rich cocoa flavor. I choose to make my brownies in cupcake molds, because…why on earth not? – Drizzle of milk (if needed. Play this by eye, only adding if it seems too thick). 1) Get the oven on, and set it to 190 degrees. Grease chosen mold for brownies. 2) Now we want to melt our butter into our cocoa – traditionally done in a heatproof bowl over a pot of boiling water, I actually managed this just fine in a microwave. Blasts of 20 seconds are recommended, just to check you aren’t burning anything. Once combined, add your pinch of salt to the chocolate butter combo. 3) Now we want to add the egg. Use a wooden spoon, and stir in gently. 4) Once the egg is mixed in, it’s time to add in the flour. Fold in until it can no longer be seen, and then your brownie mix is ready! Pour into baking tray/cupcake mold, and on top on each cake nestle in a teaspoon of peanut butter, so that the surface is flat. 1) Place cream cheese, butter, sugar and flour in the blender. Whizz on high speed for about 10-20 seconds until you reach an even consistency. If it’s looking a little lumpy, here’s the time to add in that drizzle of milk. 2) By now you should be seeing a clear dough-like texture. Remove from blender and stir in chocolate chips (and plenty of them). 3) Once your brownies have cooled completely, bang your icing on top. Just be one very happy baker and munch them all on your own! Peanut butter, cookie dough and brownie. The sexiest ménage à trois I can think of! A huge thanks to my lovely roommate and the all-round likable human Juan Kattan for some of these lovely snaps. You can check out some more of his photos on his Tumblr blog.